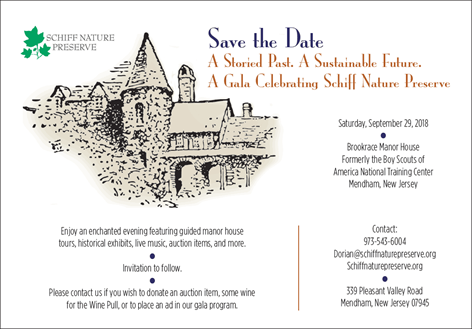 Please join us on Sept 29, 2018 for A Gala Celebrating the Schiff Nature Preserve. The gala will be held at the Brookrace Manor House (Formerly the Boy Scouts of America National training Center) in Mendham. Enjoy an enchanted evening featuring guided manor house tours, historical exhibits, live music, auction items and more. For more information or to purchase tickets please go to http://www.schiffnaturepreserve.org/gala.cfm.